The 1950s shirtwaist dress is a quintessential piece of the era, representative of iconic ’50s housewives like Leave it to Beaver’s June Cleaver and Mad Men’s January Jones. The shirtwaist dress was first designed in the early 1900s to mimic the utilitarian design of a men’s button down shirt. After World War II, the style was embraced by women looking for a practical but pretty dress to wear at home in her growing role as All-American wife, mother and domesticated diva. While known as the unofficial uniform of the classic housewife, today’s modern girl isn’t wearing her ’50s shirtwaist dress to fulfill archaic ideas of feminine fulfillment. Rather, she’s wearing the vintage style because it makes her feel like a lady, which is one of the many virtues of 1950s clothing for the contemporary girl. So to show how to wear a shirtwaist dress without actually looking like a housewife, I asked Casey of Elegant Musings to style one from her personal collection with modern day flair for looks that are still functional for day, just like the dress was invented to be. 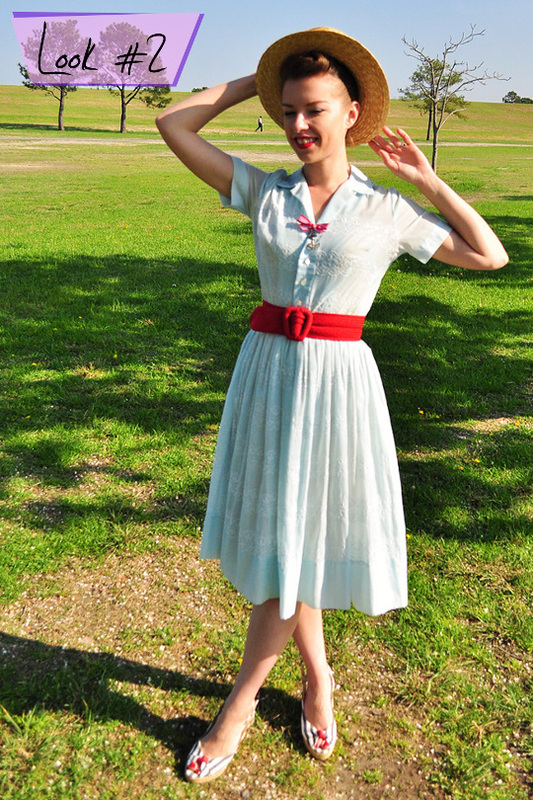 Keep reading after the jump to see how Casey answered my challenge and styled her shirtwaist dress four unique ways! By the late 1940s, magazines like Good Housekeeping were promoting the shirtwaist dress as a symbol of idealized motherhood and postwar prosperity. The era’s advertisements especially reinforced the message, showing women wearing a shirtwaist dress while using the era’s new and improved home appliances (the vacuum, washer/dryer and refrigerator, just to name a few) while looking happy, stylish and satisfied. 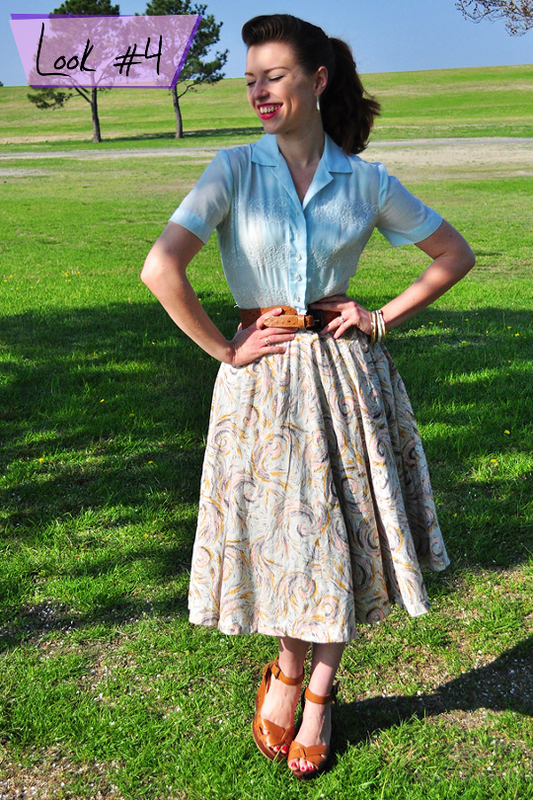 The beauty of the past is that we can use it to create a better future, which is exactly the sentiment Casey inspires as she shares ways to wear a vintage shirtwaist dress beyond the comforts of the home for everyday modern looks. Which of her outfits do you like best? Let me know by leaving a comment below the post! 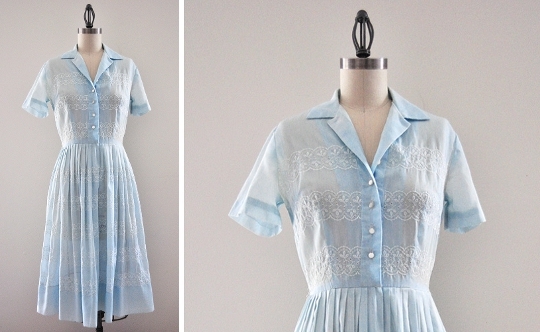 Casey’s shirtwaist dress is a shade of light blue that’s embroidered with a horizontal lace pattern on the bodice that’s also repeated along the skirt. The top’s short sleeves, white buttons and convertible collar mimic the men’s classic button down shirt the style was designed after, but remains fit for a female thanks to a cinched waist attached to knee-length soft pleats. She found this perfect spring piece at an estate sale. 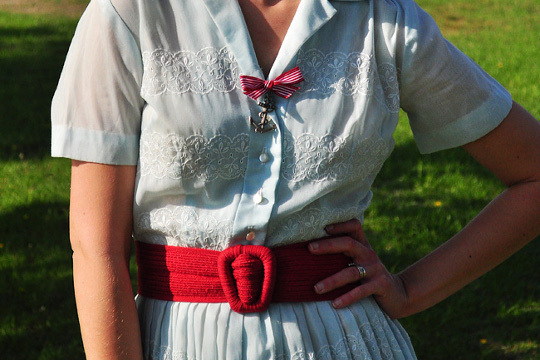 Easily shop online for your perfect shirtwaist dress by searching for one on Ebay! ELEGANT MUSINGS says: I love wearing a bright pop of color with a pale dresses! It really livens things up a bit. In this case, I chose a bright grass green cardigan perfect for taking away some of the early spring chill. I love shirtwaist dresses with cardigans because the convertible collar always adds a nice division between the cardi’s color and your skin for the most flattering effect. Since I had already added the bright cardigan, I decided to go all the way with making this outfit more quirky and fun by adding the leopard print belt and beaded handbag. It’s a bit eccentric, but I think you can get away with that look when wearing vintage! SAMMY DAVIS says: Not eccentric at all, Miss Musings — the mood of this outfit is so bright and fresh that a touch of leopard print feels nothing short of perfection. Just what the style doctors ordered! It’s amazing how a chic cardi and skinny belt can transform a dress into a skirt and top ensemble. I would never have guessed your outfit’s base was a shirtwaist dress! My imagination is spinning with ideas on how to wear this style with the knitted tops, sweaters and blazers in my own closet! ELEGANT MUSINGS says: I have an enormous weakness for nautical looks, and a blue dress just screams to have a bit of fun with this theme! The boater style hat saw a surge in popularity the past few summers, and I’m sure many have them lurking about in their closets as I do. This is my favorite “everyday” hat for the summer, since it’s a classic and not too obtrusive. Add a red belt, an anchor pin (I made this one a few years ago) and some striped wedges for a fun look worn spent in the sun or by the ocean! SAMMY DAVIS says: Can you believe that a few years ago I sold my great grandfather’s vintage boater hat at a flea market? If I still had that 1930s gem, I’d certainly wear it this spring/summer since the style is still on vintage trend for a modern look. What inspires me most about this look is how you’ve incorporated two statement pieces into one look. The red waist belt is a brilliant bright that attracts the eye, and the boater’s hat is a great piece to start a conversation with whomever happens to pass you by! I’d wear this look to a flea market in the summertime. Summer, can you please come faster? ELEGANT MUSINGS says: I went with a more romantic, soft vibe for this look. I wore my pearl collar turned around so the closure (normally front-facing) was at the back. The rotation helps give the impression my necklace is a slightly chunkier version of classic ’50s pearls. I normally don’t opt for lace-up shoes with dresses of this length, but I think the lace uppers keep the line along the ankle from looking too harsh. 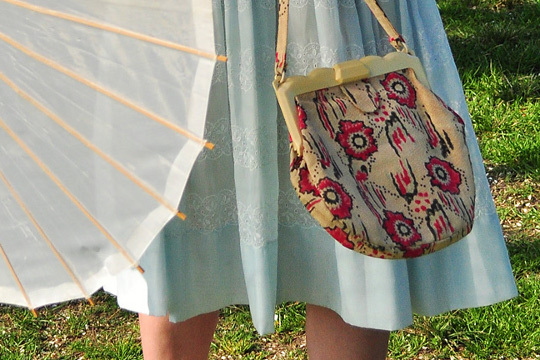 While the outfit is very restful colorwise, I couldn’t resist adding a patterned handbag for a splash of red! SAMMY DAVIS says: I could see this look worn for a picnic in a park — perhaps that is what you were doing after this photoshoot, Miss Musings! Parasols are often viewed as theatrical accessories to an outfit, but here you show how the pretty piece keeps the look from seeming too soft. 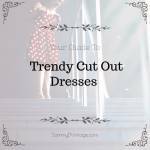 ELEGANT MUSINGS says: This is one of my favorite tricks for extending the life of a dress! Pick a favorite skirt from your closet and wear it over the dress to create the look of separates. This works best when the skirt is slightly fuller and longer than the dress. In this case, I pulled out one of my favorite vintage purchases of all-time: A novelty print ’50s skirt designed with a beautiful array of pastel hues. The belt helps reinforce the “separates” look and is a bridge between the two pieces, plus the skirt of the dress adds some pouf without having to wear a petticoat! SAMMY DAVIS says: Miss Musings, I bow before you: This is a genius idea — you’ve certainly saved the best for last! 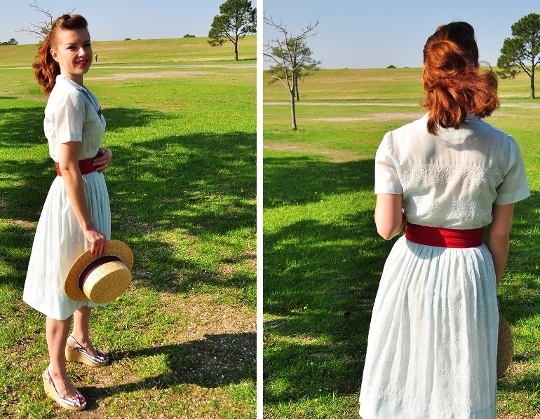 I often re-imagine a vintage piece to wear in a modern way, but never thought to use the base of a vintage dress as a DIY layer of crinoline like you’ve done here. Now that you’ve shared this styling secret, I could see this dress worn everyday with a different top skirt. No one would ever know you’re wearing the same dress. It’d be like the Uniform Project’s Little Black Dress challenge, but with a 1950s shirtwaist dress instead! Casey is a self-described “creative soul” with a fascination of vintage clothing that started early after discovering her mother’s antique clothing collection. 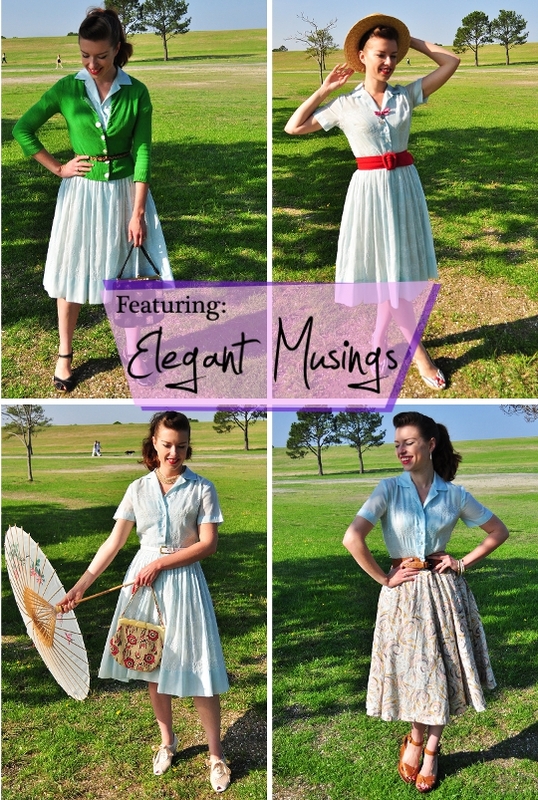 Her love only got more passionate with age, inspiring her to launch the blog Elegant Musings in 2004 where she showcases her ’40s & ’50s-focused vintage style, sewing prowess and unyielding support for vintage and homespun retailers on the web and brick & mortar. Casey currently lives in Virginia, and when she’s not haunting thrift shops for vintage, chained to her sewing machine, or spending an unhealthy amount of time playing “dress up” with her wardrobe, the nearly 27-year-old can be found hanging out with her “Sailor Husband” and their furry family members Maverick (puppy) and Freckles (bunny). Find Casey on the Elegant Musings Facebook page and watch her share style & sewing tips on her YouTube channel! All photos were shot & styled by Elegant Musings. Thank you again SO MUCH for asking me to be a part of this project!!! :) I had so much fun! Love the dress and all the looks. My favorite was the cardigan. I love a great cardigan. I really love the first with the green cardigan. Great colors! The dress is so feminine. 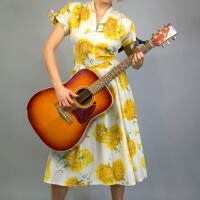 Does anyone currently make a pattern for this dress or do you have to find a vintage pattern? Thanks, Kels! 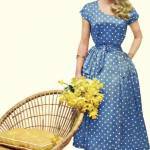 :) You can still find classic shirtwaist style dress patterns; I dug up a few for you! They aren’t exactly like the dress I wore, but more modern versions of the classic style. If you’re looking for one just like mine, your best bet is hunting down a vintage shirtwaist pattern (still relatively plentiful on Ebay and Etsy). Casey thank you so much!!! I love look #4 – Great ideas! I have always loved Shirtwaist dresses. 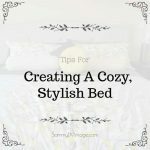 I swear it is one of the best ways to stay cool during the sultry summer (and spring!) months here in the south. 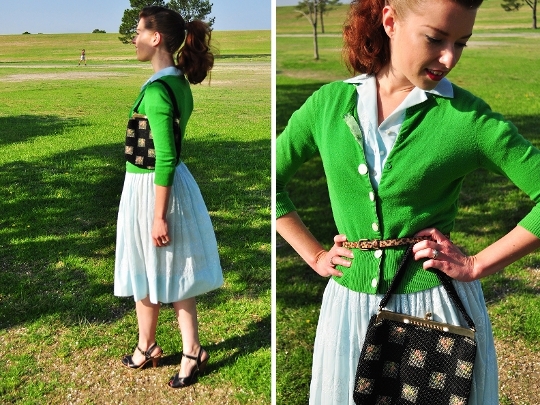 My favorite “Casey” style is pairing the dress with the cardigan. Layers are perfect for going from over-air conditioned insides to sizzling outsides. Thanks for sharing, Sammy! Such a fantastic idea, I love seeing one outfit restyled in different ways! It’s easy to just take what you have in your closet and forget you can put a little twist on it. I love all of Casey’s outfits, but my favorite is the last one with the skirt. I think that’s such a smart idea! Like Janice above me I’ve always loved shirtwaist dresses, so I may have to give this wardrobe trick a whirl! Great post! I am currently obsessed with Mad Men, so this is quite timely! Agreed! And the best part is how the style gives us all such a teeny tiny waist. BONUS! Love the idea of these four ways to wear challenges. Never thought of putting a skirt over my shirtwaisters but why not? It’ll be like a built in petticoat. Exactly! I really died when I saw what Casey did! Pure genius. Shirtwaist dresses are so versatile as Casey has illustrated– love the first option, never would have thought of pairing bright green with light blue and it looks amazing! I used to wear them often in the 80s, I only wish I hadn’t sold them, boo! ): I found I used to do one of two looks with them: either dressed down casually with converse high tops and a denim jacket; or glammed up with heels, dressy jewelry, and a fur piece (usually a vintage fur jacket or stole). 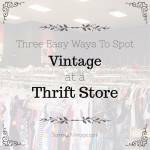 I do have a few 40s shirtwaist dresses that escaped my massive wardrobe culls, but the 50s styles are much more handy to style! 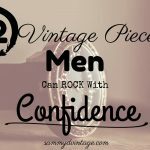 I am lucky enough to get to work around vintage clothing all day and I love to see such versatile ideas using just a few items. My favorite is the green cardigan. Glad I found your blog Sammy! You know ladies, it’s a shame, I’ve got vintage love all day long, but alas, rarely do I find anything for the BBD’s (Big Beautiful Dolls) such as myself. Thus, I sew for myself. Getting into 18/19th century, and 1950’s fashions. DON’T GIVE UP! DON’T GIVE UP! Lyric I am partnering with a great ’40s-’50s inspired fashion brand, STOP STARING very soon to share the great styles of those eras for any size! Have you ever heard? What oh what do you do for work? Yes, how fortunate you are. I’m drooling at the thought of it. I do the fourth style with my own skirt dresses when I'm not feeling one colour :D The double layer of skirt has such a feminine rustle and is great for cooler days. It's also nice with an asymmetric hemline, to show off a little of the skirt underneath for a little bit of added flair that has people commenting all day. The shoes in view #3 ARE TO DIE FOR. I’ll double check, Sammy. Thanks for helping. Where, oh where, may I find a pair of shoes similar to view/look number 3? I have ALWAYS loved this shoe. Oh rats; link works, no shoe though. I’ve swarmed Casey’s site, but see no way to email her. Daaaag. A 53 y/o pout is ugly, ain’t it??? LOL! Lyric I am getting to the bottom of this for you! stay tuned!